I like them. 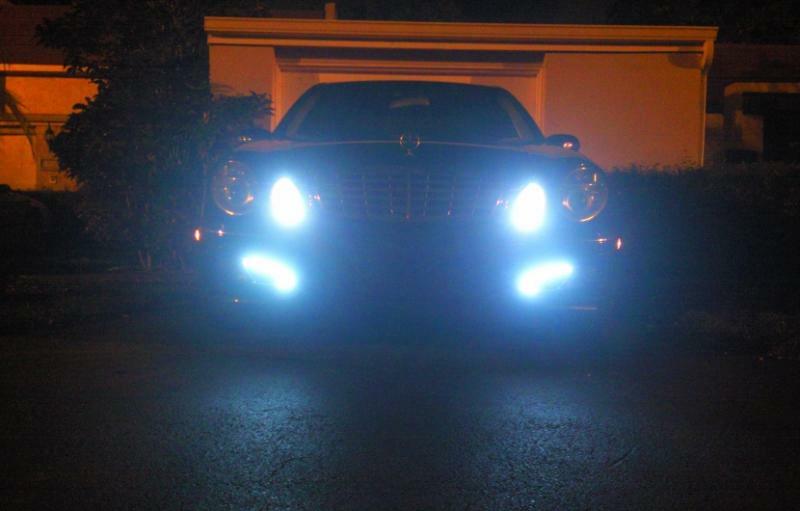 They certainly look better than people who try putting the W212 LEDs on. Is that just flexible LED strips you put on there? or was it something designed for use on a car? Thanks, and sorry if the pics dont look that great its just hard to take pics of them so they can come out clear. Anyway, yea they are 6 inch flexible LED strips i bought on ebay believe it or not and i wired them up to my DRL's. Trust me they look sick around dusk just before it gets dark I'll try to get clearer pics. 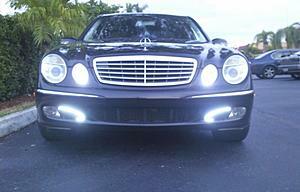 I also have LED bulbs in the DRL's and i'm getting HID's on my low beams and fogs soon. look nice..how does it look in day time???.. only 6 inches for the strips?? is this something like this one?? 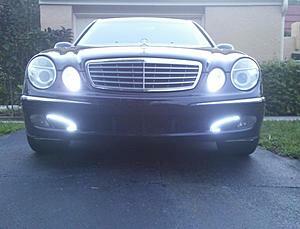 did you need an HID kit for the led strip and city lights? or was it just plug and play? 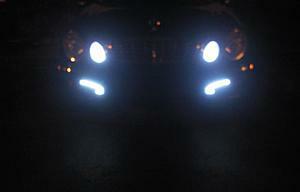 No the LED bulbs in the DRL's are just plug 'n play but they are error free CAN-BUS so the dash won't show any messages. Now for the LED strips, I got those from ebay: http://cgi.ebay.com/48-LED-White-Fle...item4aa23b8090. The ones I put are 6-inch and i basically just wired them up to get power from the DRL's. So when i have the DRL's on, the strips are on too. Not sure how I feel about the shape yet, but looks interesting. At least it doesn't look like you're trying to emulate and rig another cars LED design onto it. Would have been even better if you could have replaced the Fog lights with them, looks wise IMO. Actually, it is a unique shape, after looking at it again, I think the shape does look pretty good to me. Thanks, I did want to put them somewhere else like you said replacing the fogs for them but it just seemed like a lot of work so i just thought of this shape and to my surprise it came out awesome. I am going to put HID on the fogs and low beams to match everything up. Yeah, I'd definitely go HID Fogs so it'll all be hyper white. Looks cool though, I'm sure it's a catching look when someone sees you behind them. Problem with LED's is, right now since everyone's jumping on the bandwagon, lots of people are rigging aftermarket units on their cars, and there's a VERY fine line between cheap-o look, and "OEM" look.... Which to note, even some OEM's are looking kind of aftermarket these days. Anyway, yeah, that just makes good/quality setups look that much more proper. I totally agree I have seen many poorly setup cheap auto parts or auto zone LED strips on many cars here in Miami, but some people do a very good job and it looks good. But yea i will be putting in HID's pretty soon. Oh man, yeah, I'm sure you get your fair share of those unfortunate sites on Miami, lol. SoCal isn't a cake-walk in that regard either. Alright i'll keep you posted on the progress of the HID upgrade. I'll post pics up too. Curious why you would show a nighttime picture, as all the LEDs fitted to 2010 German cars are daytime running lights. You should try to get your hands on a facelifted W211. You'd have to change the shape since the fog light area is a different design, but man, I think it would look awesome if done right. K-A: I just realized you have a W212! I thought you weren't going to pull the trigger on that one? Last edited by lboudreau; 07-26-2010 at 01:48 PM. Nowhere to put his LEDs there. True. But if you have the non sport version like I do, the chrome parts around the fog lamps are not there, thus it should be possible to fit them in. 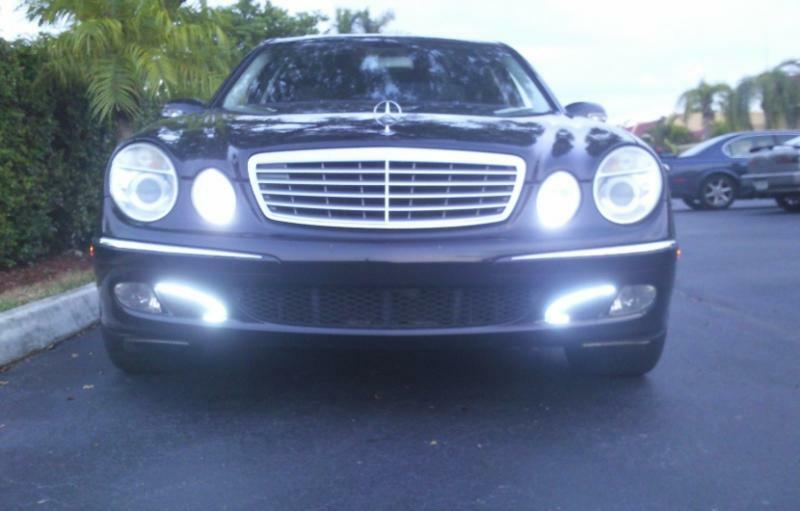 Although if they still don't look good, you could always remove the whole fog lamp and just have the LEDs. Well you made a great choice on the colour man, love white on the 212. Thanks man!! Yeah, the White and the whole Package with the Pano, P2, and interior combo really sold me on the W212.... Finally, haha. It does ruin the elegance of the E class in a way at least imo. I wouldn't go so much as to say it is ricey. But I will agree that it takes away from the elegance of the car. I like them because they are the closest thing the the 212 DRLs without looking exactly like the 212 DRLs. Its expensive, but worth it if you don't like the look of a custom setup. How about mounting the LED on both left and right side of the fog. 3 o'clock and 9 o'clock of fog light.